James Glen Cain, 73, of Midland, died early Sunday morning, October 28, 2018 at his home in Midland. He was born August 24, 1946 in Ann Arbor, son of the late Ralph and Bertha (Bryant) Cain. Jim grew up in Milan and graduated from Milan High School Class of 1965. After high school he attended Northwood Institute Where he obtained his associates degree in Liberal Arts. On September 9, 1966 he married his high school sweetheart Susan Hanson in Milan. Together they moved to Midland and raised two sons Jimmy and Jeff. Jim started his career with the Dow Chemical company in 1968 and retired with 38 years of service. He was an avid hunter and fisherman and most of all loved spending time with his boys and later spending time with his grandchildren. He loved watching them play sports, drama, band and all of their extracurricular events. He loved to cook, garden and can. Jim was always taking care of others and will be remembered for his gentle kind heart. In addition to his beloved wife of 52 years Susan, he is survived by his son, Jeff (Char) Cain; grandchildren Bryon, Micah, Shelby, Jayci, and Sofia; sister-in-law Judy; brothers-in-law Jimmy Dale (Shelia), Roy Meadows; aunt Irene Baisch and many nieces and nephews. He will also be dearly missed by special friends Jim Markey, Rob Clark, the Keskey, Markey, Smith, Nelson, Wilson, Willman, Clanton, and Rivette families. 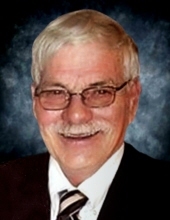 In addition to his parents, he was preceded in death by his son Jimmy Cain; sister, Mary Medows; mother and father-in law Grace and Dale Hanson; sister-in-law Pat Japp and nephew Danny Hanson. Funeral services for Jim will take place at 11:00 a.m. Thursday November 1, 2018 at the Ware-Smith-Woolever Funeral Home, 1200 W. Wheeler St. with burial to take place in Jerome Township Cemetery. Jim’s family will receive friends at the funeral home on Wednesday from 4-8 p.m. and on Thursday from 10:00 a.m. until the time of service. The family has asked that those planning an expression of sympathy may wish to consider St. Jude Children’s Research Hospital. To plant a tree in memory of James Glen Cain, please visit our Tribute Store. "Email Address" would like to share the life celebration of James Glen Cain. Click on the "link" to go to share a favorite memory or leave a condolence message for the family.